We’re loving learning the techniques of getting living foods into our diet, and one of the easiest to master is the fast-turnaround ferment of water kefir (also known as tibicos). This yummo probiotic soda requires very little effort, minimal waiting time, and is just asking for some experimentation with the huge range of flavors you can work into it. 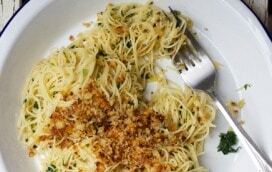 And of course, it is packed with so much good bacterial and probiotic action – good for your gut and immune system. To make water kefir you’ll need to get your hands on some water kefir grains (not to be confused with milk kefir grains which make kefir from, you guessed it, milk). Kefir grains have a tendency to multiply with each batch, so if you have a friend that has some they’re using, ask if they will happily share their excess with you. Or see the links at the bottom for some alternate leads. Once you’ve got the grains – which are actually not a type of ‘grain’ at all but a symbiotic culture of bacteria and yeasts (SCOBY) – in your hot little hands you’re ready to get going. Besides the basic sugar and water needed, adding in an extra ingredient like a few dried apricots of figs will aid the fermentation as the kefir grains are happy to have a bit of diversity beside the pure sugar to feed on. Dissolve the sugar in the water. If needed mix the sugar with a bit of hot water first to dissolve then mix in the rest as cold water. The sugar water should be cool for when the grains are added to keep them healthy. Add your dried fruit then, add your kefir grains and mature solution. Leave uncapped but covered with a cloth and rubber band for one to two days – sip it as you go to get a feel for what 1 day as opposed to 2 day water kefir tastes like. 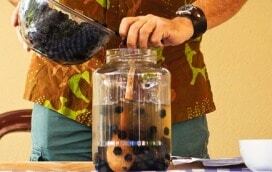 You can also make your water kefir in a closed jar however this will increase the alcohol content (ever so slightly). After this time pour 4/5 of the fermented kefir into a new jar or bottle while removing the kefir grains with a strainer. Keep these aside and start another batch with the 1/5 of liquid that you didn’t decant. At this stage, it’s second ferment flavouring time! Take the decanted kefir and add another spoonful of sugar (to taste) plus/or the flavours you want – juice, slices of fruit, berries, herbs, ginger, whatever. Cap the bottle and leave on the bench another 12 – 24 hours till it’s as fizzy and flavoured as you like it. Then drink, or refrigerate to slow ferment. The flavour possibilities on this second ferment stage are endless. Might I recommend starting your family off with a simple lemon and sugar combo if you’re wanting a smooth and happy uptake of water kefir. It’s prettymuch like home-made lemonade once you get it right. From there, reduce sugar gradually and get funky with your flavours. Until I got it, I was a bit suspicious of water kefir, because that seemed like an awful lot of sugar to be scooping into our daily diets. But the sugar that you put in is the food for the kefir scoby – it literally eats it, converting the sugar to the tangy ferment that is water kefir. So at the end of it all, you end up with very little actual sugar in the final product. Of course, if you like it sweeter, you can add extra. It’s up to you. Can I use other sweeteners? Well, in theory, yes you can. But might we recommend that you incorporate these into the second ferment stage, so that those alternate sweeteners don’t come into direct contact with the water kefir grains. This is because the water kefir scoby has evolved on cane sugar and water, meaning that in this selective environment (water and cane sugar) this scoby can be relied apon to do its thing, out-competing all other yeasts and bacterias in the mix and creating a safe and awesome brew. 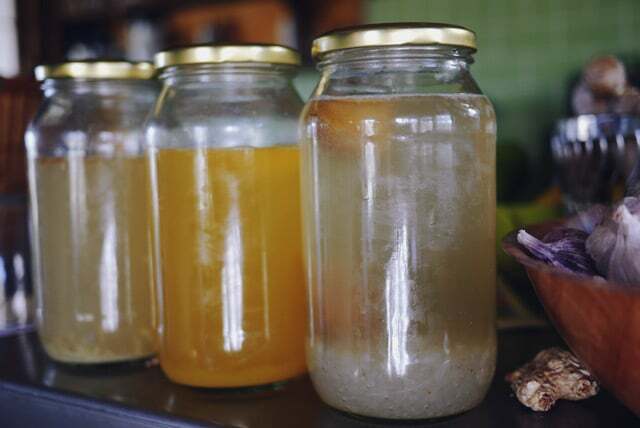 If you vary the ingredients of that selective environment, say with coconut water or agave syrup, you will necessarily alter and evolve the scoby. Which might not be a bad thing, it’s just that it won’t be the same one that has proved dependable and safe for many generations of drinkers. If you add alternate sweeteners to the second ferment, however, you’re fine on this front, as the resultant brew will be entirely consumed, and not re-entering the fermentation cycle. 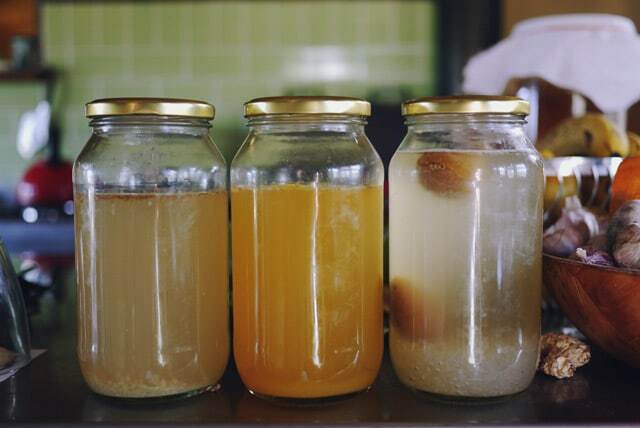 Water kefir is one of the many living food techniques covered in our new Fermentation Workshops – a one day hands-on affair with lots of take-home cultures to get you started. Try your local permaculture networks, sites like Gumtree or eBay, the Rejoice in Life site where people share their excess, or purchase some from sites like The Natural Therapy Shop. If you’re on facebook, see pinkfarm’s cultured community list of ferment swappers too. If you have any more ferment-swap leads, comment below and we’ll add them here! We’d also love to hear what your favourite flavor combo is, if you’ve already got a batch of water kefir going on your bench? Summer downtime is the perfect chance to get fermenting, even if . .
Master Tonic, or Fire Cider, is a potent home-made remedy for win . . Bread doesn’t often get the opportunity to go stale in this hou . .
I’ve been meaning to get onto water kefir for a while now. My daughter loves ‘bubble water’ i.e. soda water but it would be great to get her (and the rest of us) some extra probiotics instead! Gotta say it’s pretty perfect for little kids that come inside pooped from a big day or runaround – it’s like kiddie gatorade. only awesome. Is water kefir the same as kombucha? Last year I was on antibiotics for an extended period of time so I took up taking lots of Kefir. Tried making it but it did get out of hand. This sounds like a great drink to get my whole family on; thanks for the tips. Maybe I’m missing something, but if you’ve never made it before, how do you come by the “small amount of mature water kefir from a previous batch” ? If you’re talking about the grains, yes you need to source some in order to begin. sources at the bottom of the article. I love putting lots of ginger and herbs like lemon verbena, lemon thyme, sacred basil, sage etc in the second ferment (I think of it as my medicinal kefir – using the herbs that my health is needing at the time! – I reckon the fermentation does a great job of extracting the medicinal properties of the herbs). We also make a more carbonated (and slightly alcoholic) version where we fill Grolsch beer bottles a good 2/3rds of the way with strained 2 day old kefir and then top up with a juice of our own apples with generous amounts of ginger and tumeric (both excellent anti-inflammatories – or just use ginger if you want a ginger beer like result) for the second, capped fermentation. Make sure you leave a VERY generous air gap. The bottles need to be refrigerated after 2 days and then opened very slowly and carefully as they are very fizzy! (also good to rinse the bottles with boiling water before bottling). I hadn’t heard about recycling some of the fermented liquid into the next batch before – I will try that, thanks. 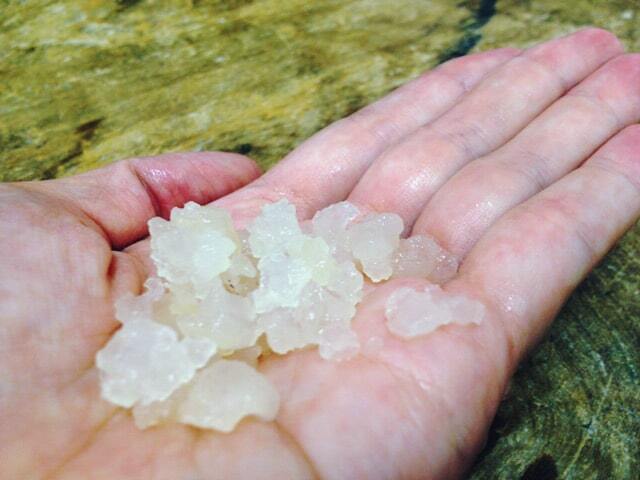 Also, we use organic rapadura sugar because of the mineral content. Dom suggests that if you use white sugar with the minerals removed, it’s good to add a teaspoon of blackstrap molasses for the long term health of the kefir grains. By the way, I find that an easy way to remember the proportions is that for every 1 tablespoon of kefir grains, measure 1 cup of filtered water and 1 tablespoon of rapadura. So, if you’re making a litre, you need 4 tablespoons of kefir grains and 4 tablespoons of rapadura. i think the need to burp must vary between strains – my friends tibicos needs burping multiple times a day, ours just needs good burp every day… but both end products taste similar… hmm. Thanks for the good tips! I have just made my first water kefir & bit superb ,just done a second batch which i am going to try secondary fermentation All so i have been brewing milk for a while now like it but some people are a bit dubious , it will be interesting to see the reaction to water kefre. .
Cat has mentioned being careful with the gas which is produced during water kefir fermentation. “Burping” regularly to manage the gas is very important when you make water kefir. Bottles are known to explode if the ferment is not regularly (and carefully! ) degassed. If you experiment with different sweeteners, do not use honey – its antibacterial properties affect the SCOBY. How does it compare in flavour to kombucha? I always do a secondary ferment with kombucha using fruit and love it, but my not so young kids still don’t like the vinegary taste. does water kefir have that sour taste? I’m in CQ so would love to try some if anyone has any…. I regularly make water kefir but haven’t ever added 1/5 of the old kefir to the new batch. I do this with kombucha to maintain the pH level but I have never done it with water Kefir & haven’t heard anyone else suggest it, so I checked Sandor’s book but he doesn’t speak of it either. Is there a reason you suggest it? Our batch rarely makes it to the second ferment, as it is usually drunk as soon as it is ready. But if we do wait for a second ferment, I usually add fresh ginger juice. Sometimes Apple juice; turmeric, berries, whatever takes my fancy. I’ve been making kefir lemonade for ages and we love it. I’ve never put the dried fruit in the first ferment though. What’s that for? Hi everyone! I have a good quantity of grains available to anyone in the Taree area, or surrounds who can pick them up. I will also post in the mail but ask that you pay $10 into my account before I send out the grains to cover container, postage etc. The $10 is only because it is costing me around that much each time for postage, and so far it has cost me hundreds of dollars for postage which I can no longer afford … sorry! I will also have more kombucha ‘mothers’ available again soon. I need to taste someone else’s kefir as these little buggers are driving me crazy. I can NOT get them to grow. A few bubbles, sure. A kefir taste, yes. But growing them…. I might have to seek her out too as mine are teeny tiny. I’m used to the sourdough starter which seems to be happy no matter what I throw at it. The kefir though… sulky, moody and reluctant. I can well imagine that there are differences between strains of water kefir. I also remember reading, I think from Dom’s site, that propagation of the grains relies on the right ratio of sugar to water (so there is enough energy for growth – see my comments re ratios in my post above) that there are minerals in the medium (so therefore he suggests adding molasses if you use refined sugars), temperature etc. I also think he said something about ginger seeming to be a growth promoting factor (water kefir might have been the original ginger beer plant, he says). I think the culture does slow down over Winter but I still seem to always have more good sized grains than I need – regularly having to take out grains when I am just wanting to ferment one litre at a time. I always have a few slices of ginger floating around with the grains or grated ginger wrapped up in a clean square of muslin. I have attached a few links that I have found useful – particularly the information about how to revive your grains if they are a bit poorly (it worked for me when I was given grains that had been in the fridge for too long without feeding and were a bit “pickled” – poor darlings!). Happy fermenting! I live on the Sunshine Coast and would love the opportunity of attempting to make my first litre of water kefir….as there anyone close by that has 1 – 4 tablespoons of water kefir grains available please? We love our water kefir and it has been very beneficial for my husband who suffers from inflammatory bowel disease. We always use 1 teaspoon of molasses and every so often a pinch of aluminium free soda bi carbonate in the first ferment and our kefir grains keep happily multiplying. What does the bicarb do? Is there a network somewhere of milk kefir grain users who share their grains and advice. I am trying to get some. Buying off eBay seems risky and also the whole ‘pass it on’ thing surely exists somewhere! emily, which country are you in? How does this differ from Kombucha, if at all?